A bluff collapse on Sunday evening that left 28 residents without a secure home has UC Santa Barbara students scrambling to find new housing by Thursday. The bluff was a communal backyard for the nine units on 6653 Del Playa Drive, known as The Oasis housing. After emergency personnel responded to the sudden collapse Sunday, a Santa Barbara County building inspector determined that Units 1, 4, 5 and 9 would be evacuated to preserve the residents’ safety. Though the foundation of the building was unharmed, the four ocean-facing units were evacuated in preparation for emergency demolition — the first of many steps to scale back the Del Playa property before future cliff erosion. James Gelb, owner of Del Playa Rentals, purchased the building from Ed St. George in 1992. It was built in the early ‘70s and is among 38 buildings leased by the rental group. The bluff collapsed on the day of a heavy storm, and though there was no damage to the actual residence, Del Playa Rentals returned the evacuated residents’ security deposits, last month’s rent and partial January rent. 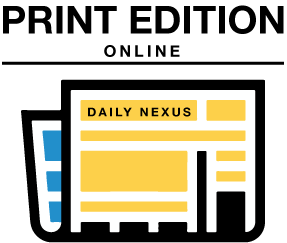 Residents were initially given until Friday to find new housing, but Gelb told the Nexus Wednesday that the county Building & Safety Department red-tagged the units for Thursday, giving students one less day to relocate. No one was injured in the bluff collapse, but “if anyone was going to be hurt on that patio, it would have been me,” Gelb said, adding that he conducts very frequent inspections of all of his housing units. Currently, Gelb has filed an emergency demolition permit for the evacuated units. Santa Barbara County will approve the permit, and Gelb said County Building & Safety Manager Massoud Abolhoda intends to expedite the process. The Building & Safety Department is responsible for approving the permit within 30 days, and Gelb said he will continue to cut back his properties to account for future deterioration of the I.V. cliffside. The entire Del Playa bluff is vulnerable to erosion, Abolhoda said, and the county conducts inspections of the rock face after every major storm. The last building inspection was in August, and though the county knows the “setback of every building” in Isla Vista, Abolhoda said events like Sunday’s emergency could not be predicted. “There’s nothing you can do to avoid it,” he said, adding that there are inherent risks to living on cliffs in I.V. The county could not determine exactly how much of the Del Playa backyard fell into the ocean, but it is estimated to be more than five feet. According to county figures, the rate of I.V.’s bluff erosion is “a source of debate,” but the bluff is retreating on average six inches a year. In extreme conditions like a storm, a cliffside can crumble by as much as a foot. If California building codes were applied in I.V., the foundation of a home would have to be at least 40 feet away from a descending slope. The county says in its documents, however, that “several geotechnical and geological studies” in I.V. have determined that a building only needs to be 15 feet from the cliff. It is the responsibility of a landowner to determine that a building’s foundation makes a home “safe and habitable,” according to county codes. The foundation of the building was unaffected by the bluff collapse, Gelb said, adding that resident allegations saying the foundation had cracks in recent months were unfounded. In the past year, Gelb said he has cut back 15 of his residences to prevent damage and injury from future cliff erosion. “I’ve done everything proactively,” he said, adding that other landlords in I.V. have also begun replacing oceanside units further back from the cliff. Students who were evacuated from 6653 Del Playa Drive will be forced to find alternate housing by Thursday, and others are still shaken from what they described as the sounds of a “massive earthquake” on Sunday. 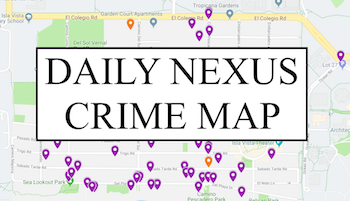 Several former residents who were contacted by the Nexus throughout the week were unable to respond, saying they were in the process of moving furniture, belongings and signing leases for new housing. UCSB is offering housing in Tropicana Student Living for up to two groups of seven students, and the off-campus apartment complex also has room for individual students. The University will not be covering the housing costs, but the Office of Financial Aid and Scholarships may be able to provide emergency grants or loans. “It seems that both the university and Tropicana each have enough space to accommodate all of the displaced students, so there should be no difficulty for any of these students in quickly finding alternative places to live,” Andrea Estrada, UCSB’s spokesperson, said. Several former Del Playa residents are searching for non-university housing in I.V., and the street-facing units are still occupied. According to Abolhoda, the street-facing units are “as safe as any other building anywhere else,” barring an emergency situation like an earthquake. The former residents will be safe entering their homes to retrieve their belongings, Abolhoda said, but residents at Unit 9 will not be able to enter the home due to a staircase that was compromised after the bluff collapse. Robin Unander, lawyer for the I.V. Tenant’s Union (IVTU), said the “situation is still evolving” daily with information from Del Playa Rentals. Unander said it is too early to determine if there is any legal ground for a lawsuit. “There is not a lot of other compensation that they would be entitled to at this point, and we need to see where all of the dust settles,” she said. On Wednesday, the Senate also discussed a resolution in support of the displaced residents, asking that IVTU provide up to $300 per student for moving costs and ensure that the students have legal representation. A version of this story appeared on p. 1 of the Thursday, Jan. 26, 2017 edition of the Daily Nexus.